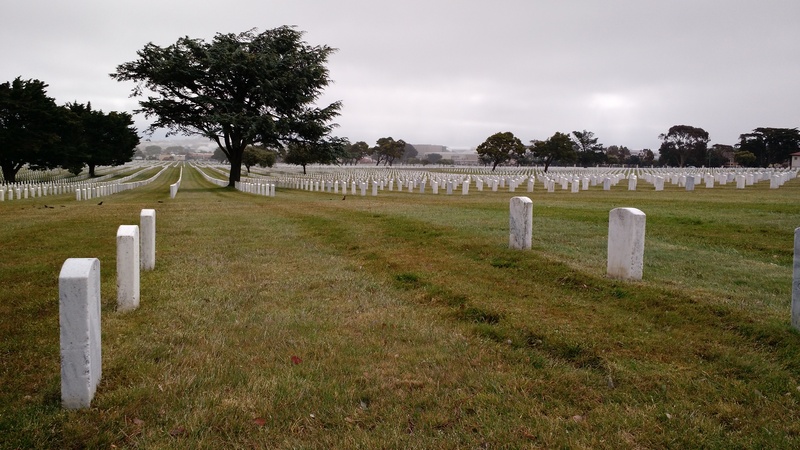 While we were in San Francisco this summer, I told Amanda the only required stop was my Great Grandpa’s grave in Goldengate National Cemetery in San Bruno, San Mateo, California. Since the summer went to pot with medical issues for our little girl, I have not posted much of California. Here is the first of hopefully several. This is a picture from Jack’s grave looking toward the east. 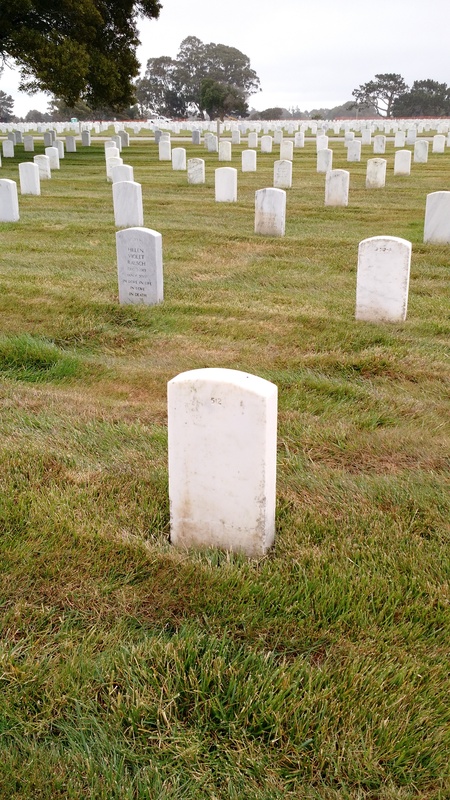 As you can tell the rows and graves go for a very long distance. Sources show the cemetery is 161.5 acres with over 145,000 interments. Jack’s is grave #512. We showed up as the rain was coming down pretty hard. We stopped at the office to find out where John “Jack” William Ross could be found within the cemetery. We obtained a map, directions, and started toward his grave. It probably only took us about 15 minutes. Fortunately the rain slowed a bit when we got out of the car. I have written before about Jack. He was born 2 September 1890 in Pulaski, Pulaski, Virginia. You can read at the link about his marriages and life. He died 13 June 1948 in Livermore Veterans Hospital in Livermore, Alameda, California. The building he passed away in is still there. Which brings to life more of the story of my Grandfather, Milo James Ross, told of when he went to visit Jack. Milo was present when Jack passed away. The rain was starting again after we had been there for a few minutes. I could not help but wonder, am I the only descendant of Jack to visit his grave? I know Grandpa wasn’t there for his burial and as far as I know never made it back. Harold is the only other son, and he was pretty negative toward his father, so I doubt he personally made it. How lonely is that? Some of Jack’s nephews lived in California, but I doubt they ever paid a visit. Who knows, but that I suspect I am the only descendant to visit his grave. 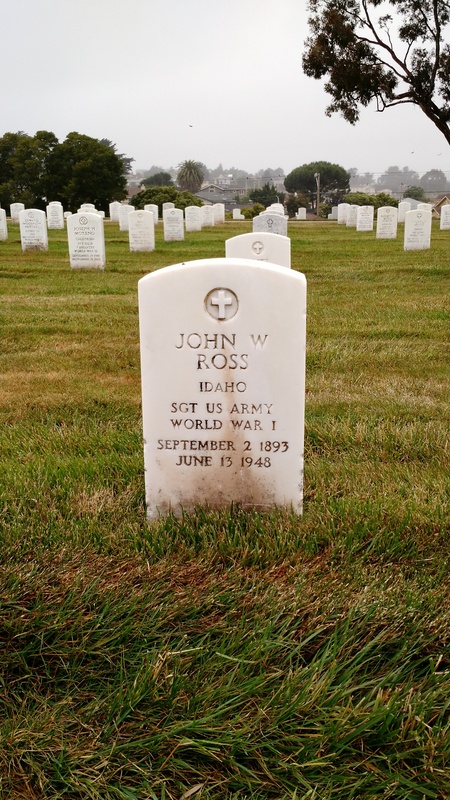 Paul Norwood Jonas Ross at the grave of John “Jack” William Ross at Goldengate National Cemetery in San Bruno, California. Rest well until the Resurrection. This entry was tagged California, Graham, Livermore, Pulaski, Ross, San Bruno, San Francisco. Bookmark the permalink.